Dave and I both love breakfast for dinner — so I usually make it about once a week. Often, it’s something simple like blueberry pancakes or ham and cheese omelets. However, when the weather starts to cool off, I have a strong desire to start using my oven as much as possible and I’m always looking for new baked egg dish recipes to try. I’ve been on a “quiche kick” lately and have tried out multiple different recipes. We both love quiche, but I’ve noticed that I don’t love it as much when it has a pie crust. I don’t know why — I love pie crust on pies, just apparently not with my eggs! Plus, I don’t like making my own pie crusts and the store bought crusts are getting really expensive to buy. 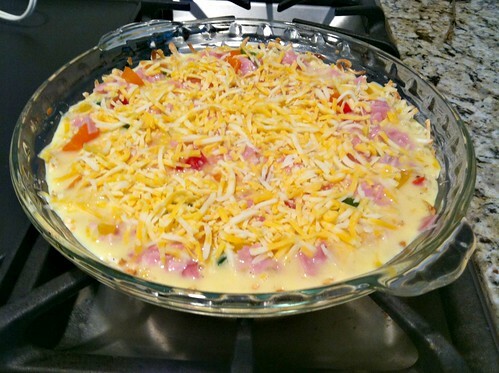 In the past, I’ve made this quiche recipe (using crescent roll dough) and we really love it. However, last week, I tried something new — hash browns as the crust! Dave and I are big hash brown lovers so I thought, I wonder if I could make a crust with hash browns. Since we almost always have shredded hash browns in our freezer, I gave it a try… and was pleasantly surprised with the results! If you’re looking for a new breakfast, brunch, or breakfast-for-dinner recipe, I’d highly recommend giving this one a try. 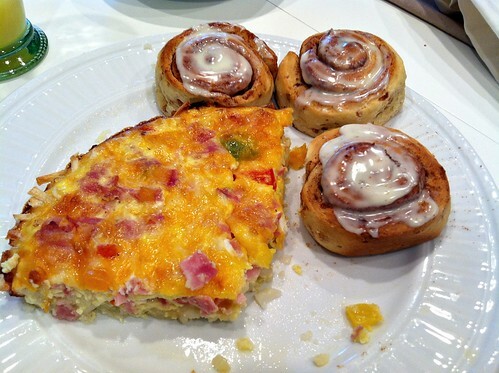 Dave is traditionally a big “breakfast for dinner” kind of guy, so he was thrilled with the quiche and fresh fruit… but when I brought out the cinnamon rolls, his eyes lit up like a little boy who was allowed to eat ice-cream for dinner! I have already made this recipe again since trying it 2 weeks ago, and I’ll definitely be adding it to my list of simple go-to meals. Just wanted to say I am making this in the next week, we received some venison maple rope sausages and I’ve never cooked with them or even tasted them. So, I thought maybe putting them in a breakfast casserole-type dish would ensure whatever I do with them is delicious 🙂 TY!! If you double it, how long does it cook? I always make a quiche christmas morning. I tried this recipe this year. My family RAVED about it. Don’t you love it when you just nail it?! Delicious! My favorite quiche recepie by far! Loved the hashbrown crust! Yay — glad your whole family liked it! Thanks for sharing! Total win for tonight’s dinner!!! thanks Ingrid! Glad you liked it! I love this recipe, I make it too! You can vary, I use brocoli or cauliflower preboiled instdead of meat, and it tastes delicious! I actually use any leftovers or veggies that we won’t eat! 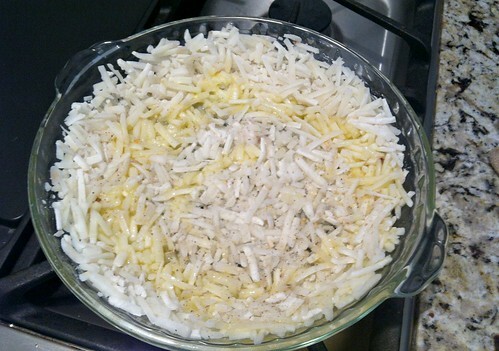 😀 I also do this with preboiled rice instead of hashbrown, it is really good too if you like rice and have leftovers. 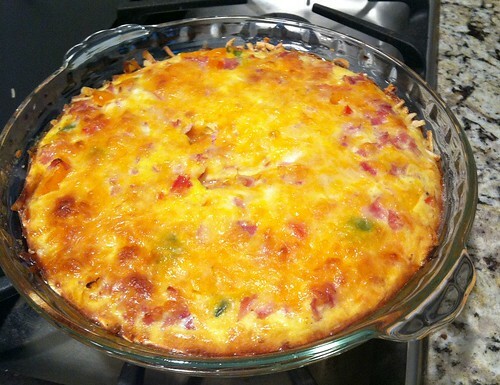 I don’t like the pastry in quiche either, years ago was introduced to fritatta and loved it. Give it a try sometime, our favorite is broccoli and cheddar. I love brinner! 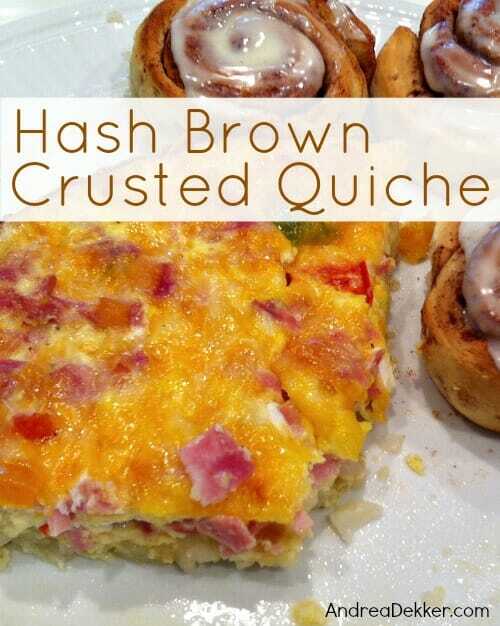 I love eggs and am okay with quiche but never really “loved” quiche but the idea of the hash browns is fantastic! Really clever, thanks so much for sharing! I had one night set aside for a breakfast meal this week. I have all that on hand so I know what’s for dinner this week! We are still warm in south east Texas, but we have some rain coming. Perfect meal for a rainy evening. Thanks! 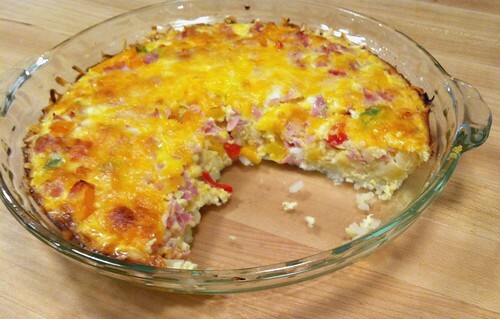 This isn’t just a great hearty quiche recipe, but it’s also gluten-free! I’ll definitely be adding this to my recipe collection as I’m always searching for good gluten-free recipes. Thanks so much for sharing Andrea! Thanks for mentioning that Maria! I don’t often thing of Gluten Free recipes so glad to add this recipe to that list. So many people need gluten free now days! Thanks for sharing this recipe! I will definitely be trying it sometime! You can also do no crust. yes, I’ve tried quiche with no crust too… but this is a nice alternative for people who might prefer a crust! Where’s the cinnamon roll recipe? Those look yummy. Funny, they look different than the ones I buy, are they the “Grands” kind? 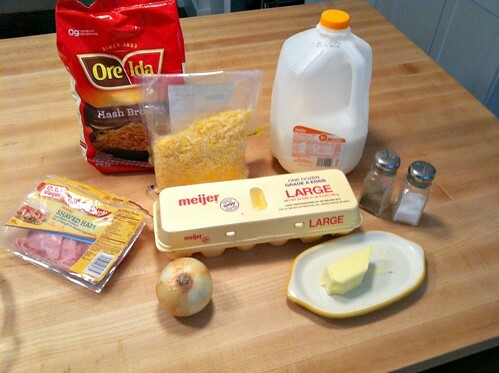 This is just like my ‘Hearty Egg Bake’ recipe, I just mix it all together and bake like a casserole. I would make mine in a 9 x 13 pan. My kids loved it for dinner, especially in the winter. I’ll have to give your version a try. Thanks for the idea. What a great idea….looks delish! We have an upcoming long wknd away at our local mountains with our extended family and i am in charge of planning & prepping all of the food, so I am going to have to give this a try!! Thank you for sharing another great recipe Andrea! Wow — have fun planning the food. Sounds like a really fun week! I’m not sure if you read this post of mine, but it’s all about how I planned and organized food for a friends retreat we had last winter. I fed 30 people for 3 full days! Looks great, Andrea! We are tailgating for a noon football game this Saturday, and this will be a great, warm brunch item to take along!